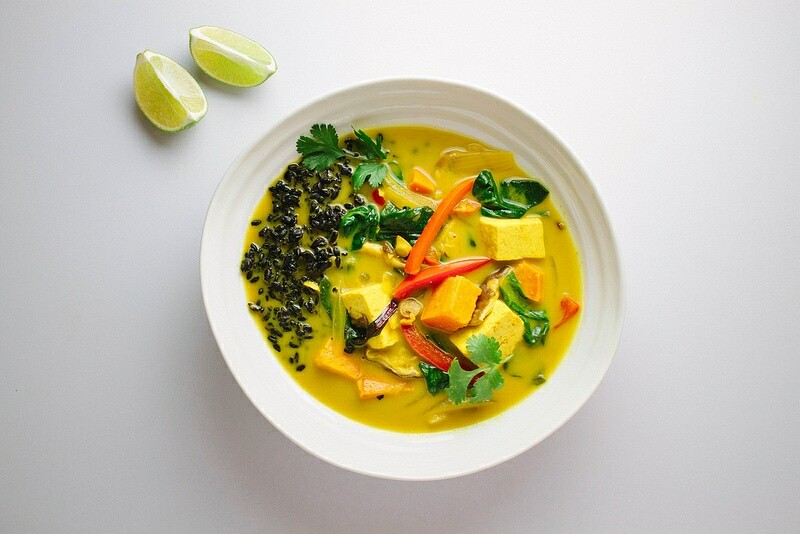 Golden Tofu Curry features sweet potato, shiitake, red bell peppers and tofu, all wrapped in a warm curry broth and served with black rice. 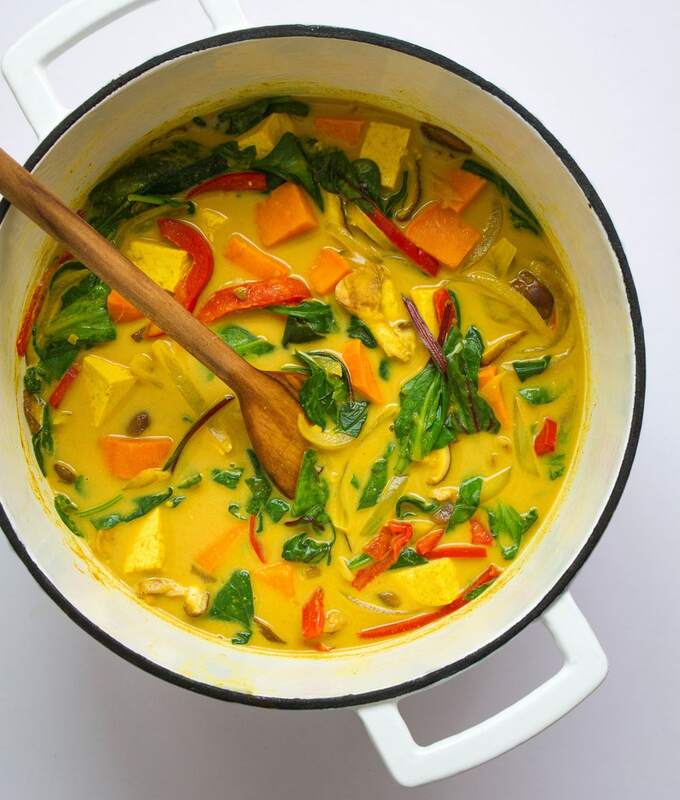 It’s a wonderfully flavorful curry dish that’s nourishing and hearty! 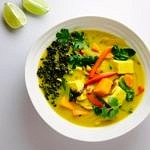 While hunting for a tofu curry, I came across this recipe, which I have very loosely adapted. I loved the use of black rice, as I’m always looking for ways to add in this unexpected ancient grain. It adds a nice contrast aside the yellow curry and brightly colored vegetables. 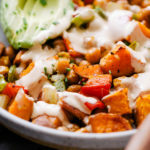 The sweet potato adds the perfect sweetness to this otherwise savory dish. 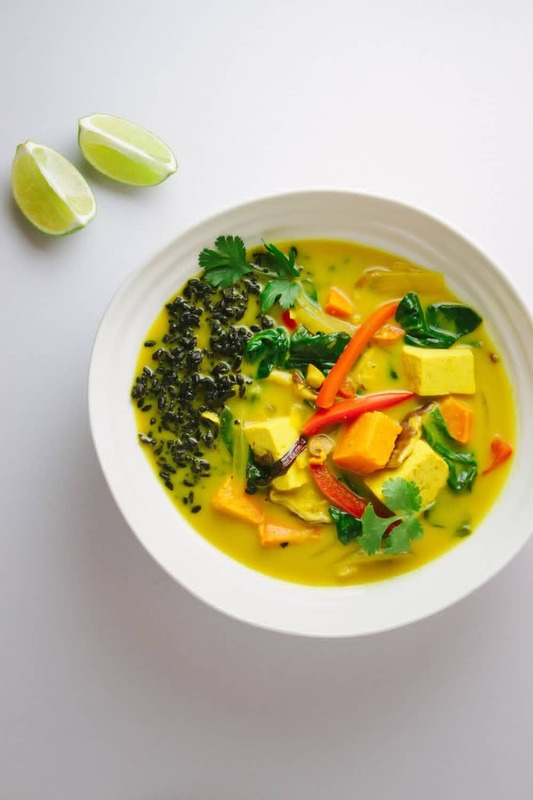 The combination of colorful vegetables, curry, turmeric, coconut, ginger and lime make for a dish that is not only bright in color but also in flavor. The mushrooms are soft, the red bell pepper al dente and the sweet potato is tender along with the tofu and onion. I’ve had the pleasure of making this tofu curry a few times since and have not tired of it yet. 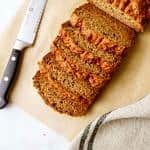 This meal is easy to put together, well-balanced and can be ready for the table in around 30 minutes. Those are all major pluses, and I hope you enjoy it as much as I have! 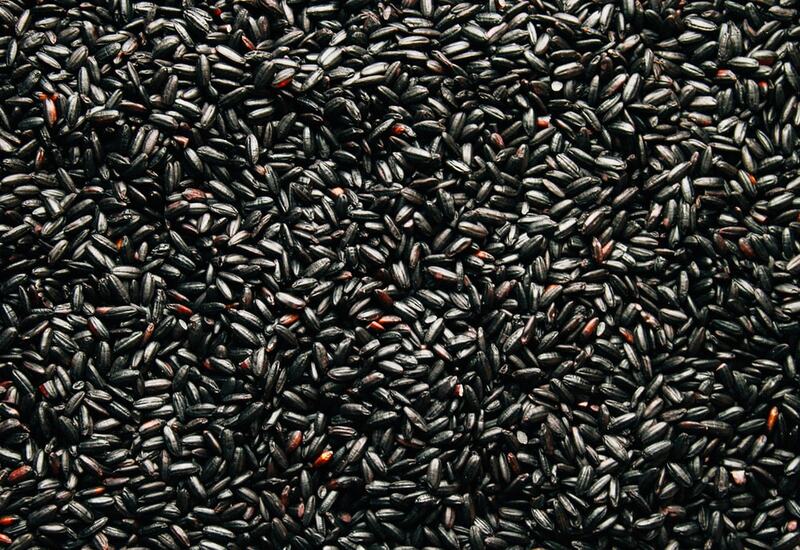 Adding black rice to your meal plans is a great way to include extra nutrition and variety. Much like brown rice it has a mild, nutty flavor. It’s a good source of iron, fiber and antioxidants. The dark pigment of black rice is loaded with the same antioxidants that make blueberries and acai so vital to a healthy diet. You’ll find black rice to have even higher concentrated levels than the fruits making it more valuable and heart healthy. 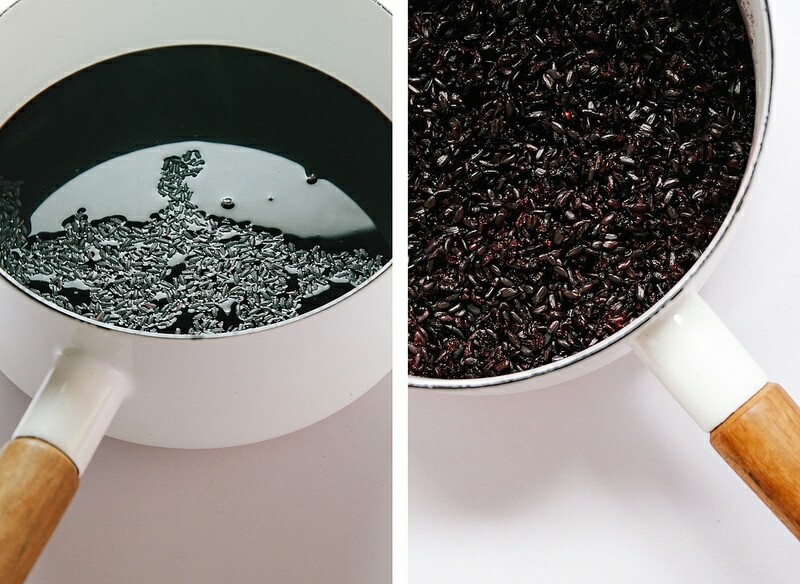 Once you add the rice to the water, you’ll see the color of the water change almost immediately. All that color and nutrition will be cooked back into the rice. Black rice cooks up fairly fast in about 25 minutes. 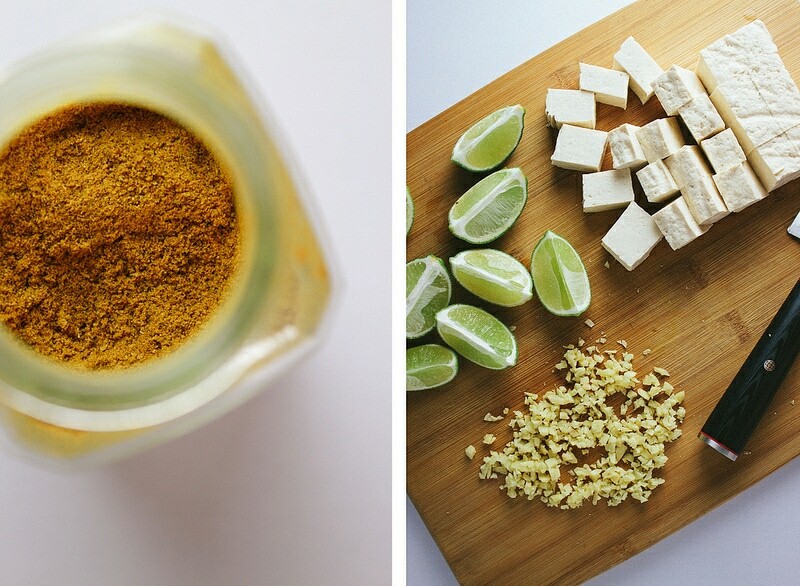 Use your favorite yellow curry powder and add plenty of ginger & lime juice. I found that the lime juice is essential to the overall dish. Without it the flavor seems flat and ho-hum. The lime juice rounds everything out sublimely (pardon the pun) with its citrusy brightness. Definitely do not skimp on the lime! A sweet & savory curry dish. The black rice adds a nice contrast to the colorful curried vegetables as well as adding a little extra nutrition. Rice: In a medium pot, add rice and water, bring to a boil, reduce heat, cover and let simmer for 25 minutes. 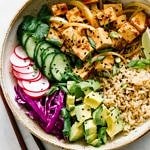 Tofu Curry: In a large dutch oven or pot, heat the coconut oil over medium heat, add onion and cook until softened, about 5 minutes. Add in garlic, ginger, sweet potato, bell peppers and mushrooms, cook another 2 – 3 minutes. Add curry powder and turmeric, cook 1 minute or until fragrant. Add in the coconut milk, water/broth/milk and tofu, stir gently. Bring to a boil, reduce heat, cover and simmer for 10 – 15 minutes, until sweet potato is fork tender. Turn off the heat, add in the lime juice and leafy greens, stirring gently until the greens soften and wilt. Serve the tofu curry overtop rice and enjoy with some fresh cilantro on top and a squeeze of more lime juice if you like. Store: Leftovers store well for a few days in an air tight container in the fridge. Flavors will enhance with time. Use large leafy greens if you prefer, just be sure to shred or chop them before adding to the pot. 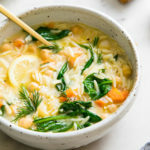 If you’re looking for a more mellow yellow color, I would suggest using unsweetened non-dairy milk in place of the water or broth. That will help soften the yellow hue. The lime juice is essential, without it the overall flavor is flat and boring. Use your favorite rice or quinoa if you can’t source black rice. I’ve found mine locally for fairly cheap. It tends to be a bit more expensive online, especially if you have to pay for shipping. 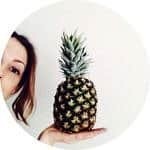 I would shop around locally and online to find the right source for you.